This ASCD Study Guide is designed to enhance your understanding of Teachers Wanted: Attracting and Retaining Good Teachers, an ASCD book written by Daniel A. Heller and published in July 2004. It will help you compare the differences between the goals for the education profession set out in the text and the current state of the profession, as you perceive it from the point of view of your current work environment. The guide will best be used in conjunction with reading the book—exploring chapter questions before reading and then discussing them after completing the relevant chapter. The questions and activities are designed to inspire debate about the basic question of whether or not public education, as it has developed in the United States, can honestly be called a profession at all. Are we losing too much talent and knowledge through retirement? Are new, tougher licensing regulations helping or hurting the profession? Why do you think so many new teachers leave teaching? How do you help new teachers at your school? Do many of them leave? Why? Should there be two principals, one for education and one for building management? How would you describe your preservice experience? Can we make better use of partnerships between schools and higher education? How? Is there an institution of higher learning in your area? How might you approach educators there to become partners? Could you characterize the climate in your building as a learning community? If so, why do you think of it this way? If not, what would have to change for it to be a learning community? How could you create more opportunities for teachers to have meaningful professional exchanges with one another? Can your school district afford this kind of innovation? What are some strategies for funding major changes in schools? Are you empowered as a gatekeeper in your profession? How could you improve your school as a training ground for prospective teachers? What is the principal's role in preservice education? How does your school welcome new teachers? Do new teachers get the worst classes to teach? Describe your mentoring program for new teachers. Or, if you do not have one, describe what you think a mentoring program should be and do. How would you choose and train mentors? Is training even necessary? What are all the obstacles your school would have to overcome in order to establish a mentoring program? How would you surmount them? Which suggestions for working with new teachers could you easily put in place? Find a copy of your school's mission or philosophy statement. Does it address the four questions posed by the author? Does it give you a picture of what you want your school to look like? How would you change it to address the issues in questions one and two? Create a process for writing and reviewing your school philosophy. Which aspects of your school seem to fit your philosophy. Which do not? How would your school change if it were truly driven by the philosophy? How might you make these changes happen? Develop some interview questions based on your actual or revised philosophy. Role play some interview scenarios. What roles should principals, teachers, board members, students, parents, and community members play in the hiring process? Recount your worst inservice experience. What would have made it better? List all the possible expertise that already exists in your school and local community. How would you redesign faculty meetings at your school in order to orient them toward professional development and away from administrative details? How could you adjust your schedule to allow for more inservice work? Does your school have a pedagogical goal for the year? If not, what would be an appropriate one? Do you work in teams? How does this work? What is the accountability system? If you do not work in teams, is there a way you could adjust the structure of your school day to allow this to happen? Explain the supervision and evaluation process at your school. Is it designed to make you a better teacher? If not, how could you change it so that it would? What are the obstacles you would have to overcome? How would you overcome them? Do teachers observe one another in your school? How do you think this idea would be accepted? Would you need special training? What is the level of trust in your school? How does the author distinguish professional supervision from evaluation? Do you agree with this distinction? Are these distinct processes in your school? If not, how could you make them so? What is the relationship among trust, control, and power in your work place? How do you define these terms? How do these factors interact? Would you say they work together to create a positive or negative climate in your school, especially as it pertains to teacher professional growth and risk taking? Who establishes trust, control, and power in the school? Whose responsibility is this? The author offers several ways to perceive or define power. How would you define power? How do you set your yearly professional goals? Do they have to relate to any other goals, such as those for the state, district, school, or department? Would nesting goals help or hinder your professional development? How many ways can you think of to gather data about a teacher's or principal's work? Do you use these sources of information to improve your practice? Are classroom observations peremptory or substantive? Why? How could you restructure your school day in order to embed professional development as a permanent part of your work? Have you ever watched other teachers work? Does this happen on a regular basis or could it? What would be the advantages to doing peer observations? Would you need training? Could teachers offer other forms of professional development in your system? How might using peers to deliver professional development affect the work place climate? The cost of internal professional development is time. How could you create the time to increase your work in this area? We have looked at many potential changes at this point. Can the principalship, in its current configuration, handle these changes? How would the job description have to change? Could those changes be made? How? Could various functions of the job be distributed differently? Describe the ways in which teachers, school boards, professional associations, and administrators would have to work together in order to support the kinds of changes suggested in this book. The author describes the principal as "the keeper of the vision." Do you agree with this statement? Can the principal do this alone? What exactly does it mean to keep the vision? While the principal most certainly must be adept at public relationships, what is the role played by teachers and board members in this area? How would you resolve the conflict between power and responsibility? For instance, is it fair to hold one person accountable for a decision made by a group vote? How can we resolve the conflicts between the principalship and faculty governance systems? How does decision making take place in your school? Are you satisfied with the process? If not, how would you change it? What issues will you encounter, and how might you approach them? Write the job descriptions for the various positions in your concept of the perfect school. Include administrators, teachers, and board members. How realistic is your vision? What aspects of it could happen immediately? What would have to change to allow the more difficult parts of your vision to become a reality? Why do so many bright, young teachers leave teaching within their first five years of service? Does the author's characterization of our current situation through the comparison with Sun Tzu make sense? Does it help you to conceptualize the issues and challenges before us? Does this country have the political will to make the necessary changes? What are the costs of these changes likely to be, other than purely economic ones? How does legislation such as the No Child Left Behind Act both help and hinder the process to improve the performance of our nation's schools? Do you read this book as a collection of ideas that might be nice to see happen but that are simply pipe dreams, or is it a vision of a redefined profession which is, however distant, within the realm of possibility? Review all of the questions you have discussed above. Then, consider the central question, "Is education a legitimate profession?" After working with that issue, go on to the activity described below. Have a group of people work together to create a concept of the perfect school. Take into account your ideal vision of the education profession and of the roles played by those involved in the profession. Starting from that vision, look at your current situation. What could be changed easily, right away? What might take a bit longer but is certainly within the realm of possibility? What would be the larger issues to tackle? How might you tackle them? Write a long-term action plan to move your school from its current condition to your newly envisioned ideal condition. Share your work and make it the center of many discussions. Then, when the vision is clear and at the point of acceptance by a critical mass of people and key players, begin the process of implementing your action plan. 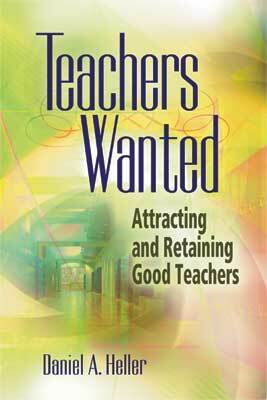 Teachers Wanted: Attracting and Retaining Good Teachers was written by Daniel A. Heller. This 116-page, 6" x 9" book (Stock #104005; ISBN 0-87120-881-4) is available from ASCD for $16.95 (ASCD member) or $21.95 (nonmember). Copyright 2004 by ASCD. To order a copy, call ASCD at 1-800-933-2723 (in Virginia 1-703-578-9600) and press 2 for the Service Center. Or buy the book from ASCD's Online Store.